Honda Motorcycles India will be launching the new CB300R today. The bookings for the same commenced in January 2019 at a token amount of Rs 5,000. 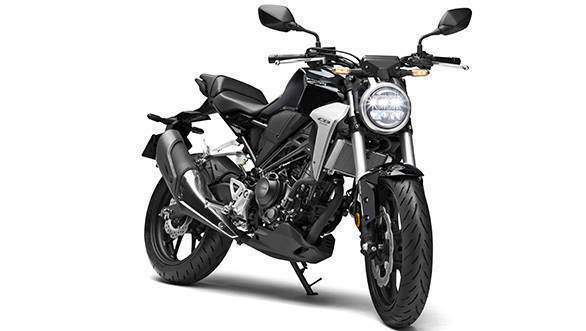 Honda has confirmed that the bike will be brought in the market via the CKD route, however, all other motorcycles in the segment are locally manufactured.�The CB300R is powered by a 286cc, liquid-cooled, single-cylinder engine with a four-valve, DOHC head, and outputs are 30.45PS and 27.4Nm. The CB300R of course boasts top drawer equipment, including a full-LED headlamp unit. It is suspended on a pair of 41mm upside down forks at the front while a 296mm, petal disc along with a radially-mounted, four-piston caliper takes care of braking duties upfront. More details on the�2019 Honda CB300R motorcycle can be read here.��Scroll below to get details on the specifications, features, launch price, booking amount including the availability of the Honda CB300R in India LIVE from the launch venue. This is more or less the same engine as the CBR300R but refined slightly for street riding. Straighter intake. Twin chamber exhaust for the sound. Doesn’t look like much, but lots of subtle tech in swing arm plus hollow axle. IMU measures state of bike but works only the ABS and prevents rear wheel lift. Centralisation and lightening has a huge impact on handling. New trellis frame plus strong pivot plate is the heart of the handling. Honda says suspension quality is unknown for the class. Monoshock has separate chambers for gas and oil. Yuzuru Ishikawa leads the project and he was the man behind the CBR1100X Blackbird and worked on the RC213V-S too! Those are serious credentials. Now Y Guleria, the man in motion at HMSI, takes stage. He says the customers are changing. They want premium bikes and that lifestyle. #CB300R is their first move in the ‘middleweight’ category. Now Minoru Kato president & CEO, is speaking in Hindi! And first some context. Best year ever for company in India last year. Today, 40million customers in all! We are at the launch venue of the 2019 Honda CB300R in Delhi. We have a detailed image gallery of the 2019 Honda CB300R LIVE on our website. Did you know? The Honda CB300R that will be launched in India shortly was first showcased at the 2017 EICMA show. Honda two-wheelers India is all set to launch its premium 300cc motorcycle, the CB300R in India. Get all the details of the motorcycle here.